When last we left our hero, she was standing in a frozen bell tower marvelling at the view and slowly turning into a Pamsicle. But that’s not the whole story. I actually skipped telling you about a remarkable little museum that’s also on the grounds of the Kievo-Pecherska Lavra. And when I say little I am truly not kidding. The Mykola Syadristy Museum of Micro-miniatures is all about being very very very little. Housed in one of the the many buildings on the monastery grounds, it seemed like an odd place for such a secular sort of thing. But with the entry fee set at a mere £1.18 and the Lonely Planet recommending a visit, there seemed no reason not to check it out. And I'm glad I did. 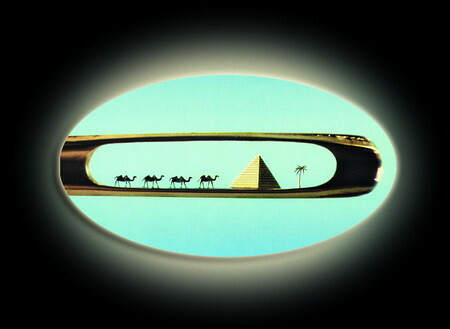 Because apparently you CAN put a camel through the eye of a needle. Or even four camels and pyramid. 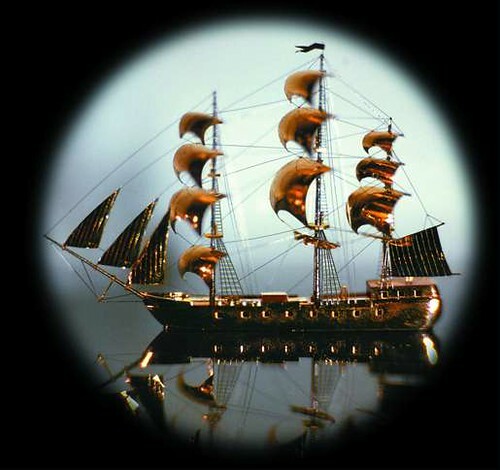 This ship is 3.5 mm long with rigging 0.003mm thick. That’s 400 times thinner than a human hair. There are fewer than twenty works on display in the museum, so it didn’t take long to see them all, which meant that even after monk mummies, the bell tower, microminatures and lunch, I still had time to wander further along the river towards the enormous statue known as Rodina Mat. “Nation’s Mother” is a 62m tall behemoth that towers over the banks of the Dneiper. 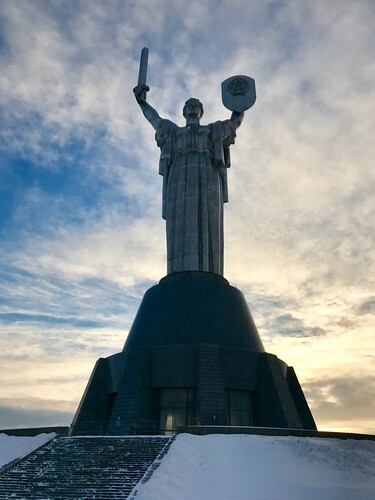 In fact, she towered slightly too much for communist authorities, who truncated her sword so it didn’t rise higher than the tops of the monastery churches. The Rodina Mat sits atop a very large plinth which sits atop the Museum of the Great Patriotic War which sits atop a dimly lit and mostly empty coat-check facility. I suppose I should say a few words about the museum, but really I mostly enjoyed it because it gave me the chance to thaw out for a bit while wandering the seemingly endless and mostly Ukrainian-only display cases about Ukraine’s part in WWII. Also the coat-check was completely adequate. For those who’ve never had the pleasure, varenyky/perogies fall into that very very broad category of dumpling-ish things that involves stuffing a bit of dough with something yummy and then boiling it. Where I grew up varenyky are almost always filled with a cheese and potato mix, though sometimes I’ve seen cabbage or even blueberry, at a stretch. 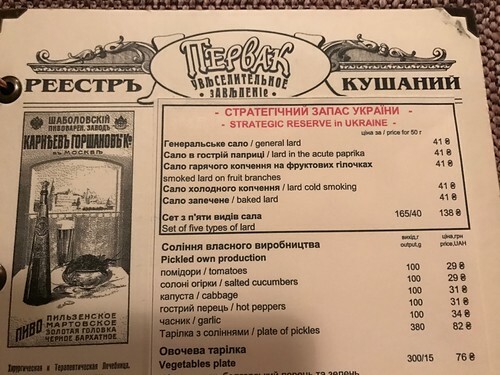 The variety of fillings available in Ukraine is truly impressive. The ones I had that night were filled with rabbit. Rabbit perogies! Other stuffings I saw on menus included kolbassa, chicken, mushrooms, liver, spinach, feta cheese, green peas, poppy seeds, cherries and apple. Not all at once. Here are my bunny perogies, served with a lovey array of toppings: crisp crackling, salo (see below), grated cheese and sour cream. Of course I also had Chicken Kiev. Because you’re not allowed to leave the country if you don't. It was unremarkable, but it had to be done. The meal was accompanied by the aforementioned flight of beer that cost 78 pence, and I finished things off with a dessert of bandareky, which were crepes wrapped up in a triangle shape filled with tvorog and baked with cream. So all in all it was a not exactly a light dinner. It’s good thing I skipped ordering from the Lard Menu. The lard they refer to is known in Ukraine as salo. 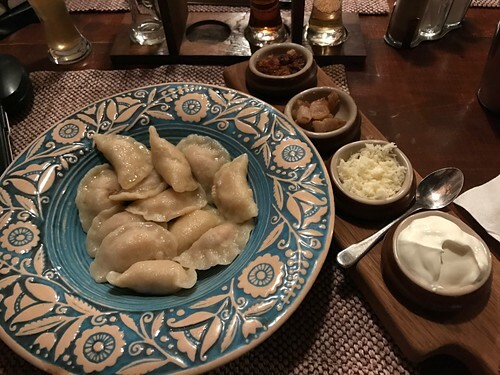 It’s basically raw pig fat and is unaccountably hugely popular and iconically Ukrainian. I tried a tiny bit in the bacon market. And while you might think I’m about to say it was surprisingly tasty, in fact it tastes EXACTLY like you are imagining cold pig fat would taste. I doubt that even smoking it on fruit branches would help. Sorry, Ukraine, but no thank you. The Chernobyl Museum was a bit overwhelming. Like the museum of the day before, all the displays were in Ukrainian, but this time I had an English audioguide that was - and this is putting it mildly - exhaustive. The main displays of the museum really only take up two large rooms, but the audioguide was particularly poorly signposted so I had a lot of trouble keeping track of what I should be looking at to match what I was listening to. It turned out the problem was that the guide was so extensive that while I was already wandering through the second room I was listening to commentary about a displays that were within about 8 feet of the entrance. I sort of gave up at that point. Happily, there was another tiny museum not far away that turned out to be totally charming. The Museum of One Street focuses on the history of each building on Andreyevsky Spusk (Andrew’s descent), a steeply descending road that goes from Old Kyiv and St. Andrew’s Church to the lower city called Podil, which is at the level of the Dneiper River. 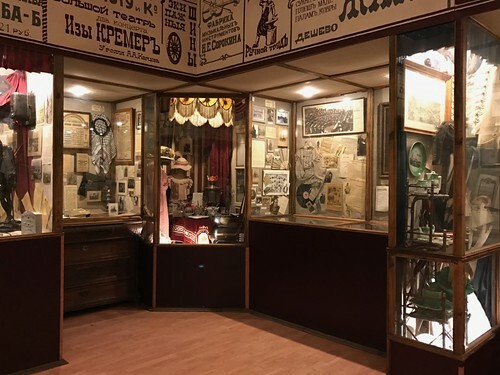 The street is one of Kyiv’s most popular tourist attractions, and the museum is one small room crammed with display cases that chronicle the cultural history of the street by telling the stories of the buildings and their inhabitants. Full of glass cases - there are thousands of articles on display. The street's most famous resident was the famous writer Mikhail Bulgakov, who lived at number 13. But mostly it was just fun to peruse the overstuffed cases. And, happily, the museum provided printed English guides to the cases, so I could sort of tell what was going on. 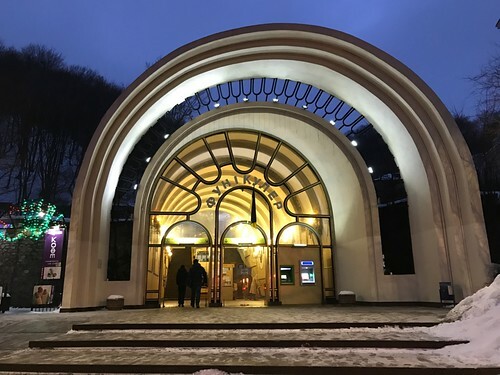 I found the discovery of the Kyiv funicular an utterly charming addition to my day and was unaccountably pleased to pay the ridulously low fare (about 5 pence) and take a seat in a car with a lot of other people and one young dog with muddy paws. In fact, I was so happy with the whole business that it didn’t even bother me when the muddy paws ended up all over my light coloured jeans. Once we got to the top I wandered home to the flat, and repeated my excellent habit of glass-of-wine-and-lounging before going out for dinner. On my last day in Kyiv I finally did a guided walking tour, which is a bit backwards from my usual habit. I normally find it’s a good introduction to a new place to find a walking tour on the first day. (GSWPL Top Tip!) In this case, it was a grey and chilly Sunday morning when I made my way to the Maydan Nezalezhnosti (the famous Independence Square). I was aiming for one of the “free” walking tours where the guide is usually a young person who survives on tips, and was half expecting that I’d get there and the whole thing would be cancelled because no one would show up because it was early and cold and Sunday and February. It turned out I was partly right, because I was the only person who showed up was the guide, Vlad, a very pleasant young man who spoke excellent English. Despite the low turnout, Vlad carried on. The tour itself was mostly unremarkable, maybe because I’d already been in town for a few days and maybe because I was getting slightly touristed-out. We hit the usual mix of monuments and churches and local landmarks like St. Michael’s Monastery and the Golden Gate (not Golden or a Gate) and Vlad kept up the running commentary. But because it was just the two of us, it was also a bit more personal so I got to hear some about his life, and the revolution, and he even taught me a new Russian word (Скользкий - Slippery!). Here’s me and the Ёжик. 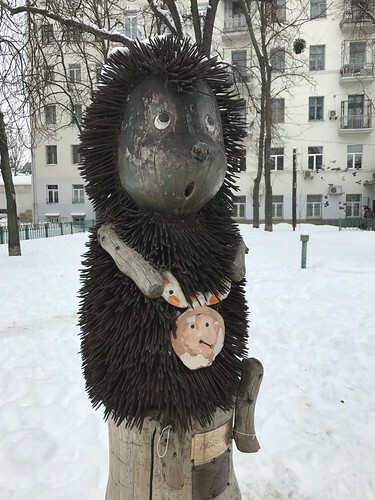 He’s made with a shaped wooden base covered in wire mesh, and his spikes are all long wood screws poking out of the mesh. He’s carrying a little bundle of jam, as a gift for the bear. By the time I finished with the Ёжик and Vlad, and had given him a nice tip (Vlad, that is, not the Ёжик) it was about lunchtime. And what does that mean? More perogies, of course! After lunch I managed a quick visit to St. Sophia’s Cathedral, but by that time I was definitely weary and dreading the late flight back to Baku and the inadequate night’s sleep I knew would follow, and the foggy, tired day of work that would come after that. It was nice to have the flat to go back to where I could finish out the day with a quiet bit of packing and one last glass of wine. 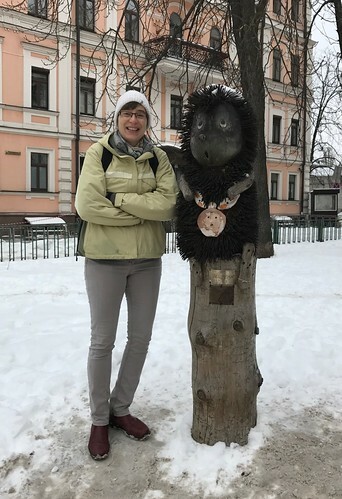 It seems that three and half days is long enough in Kyiv in February, though I suspect that in the sunny springtime I might have felt different. Still, Kyiv definitely gets two thumbs up from GSWPL. It’s cheap, friendly, relatively untouristed and with a good mix of attractions. And of course there’s the bacon and perogies. What more could you want? And finally, you may have noticed there was a slight delay in service last week. Astute Go Stay Work Play Live Readers will of course recognise that I have been admirably consistent in posting bi-weekly in the last year, barring occasional hiccups. But as I write this we’ve just finished the second week of rehearsals. This means that the time has come to allow myself a break from the blog so I can concentrate on the last two and a half months of this job with the fewest distractions possible. Normal service will resume in June. Or when I get around to it. Or not. Basically, you'll get what you get. Which, when I come to think of it, is actually really what GSWPL normal service is. Pierogies over Chernobyl ANY day!!! Do you know which park contains the Ёжик? I'm very keen to meet him, and share some of his jam?